On any material plane there can only be one Legendary Swordsmith with a single apprentice. The road to becoming one is a long trip, and the apprentice can never outlevel the master as long as the master lives. Due to a history of backstabbing apprentices, most swordsmiths have learned not to accept any assistants at all, with the result that the secrets of the swords are easily lost. 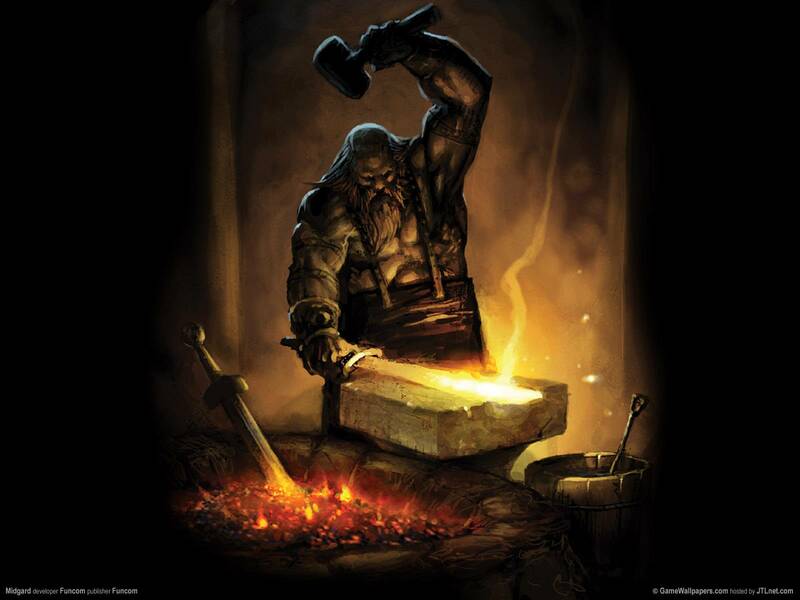 If no Legendary Swordsmith exists in your world, those who seek to become one must succeed a Legendary Swordsmith check DC 20+current level in order to figure out the secrets which unlock the new abilities. If at any point, you fail the check, you can no longer advance as a Legendary Swordsmith. At that point it might be a good idea to hire an apprentice, since those with a master don’t need a check to advance until they reach a level which their master hasn’t attained yet. Strangely enough, most masters seem to suffer unfortunate accidents at this point for some reason. The legendary swordsmith’s signature sword is one of 9 swords the swordsmith creates. Every 5th level, the swordsmith is able to create a new sword with the characteristics of all previous levels(Crafting a new sword takes 28 consecutive days). 1-handed swords have a base damage of 1d12/1d20. 2-handed swords have a base damage of 2d10/3d10. Although these swords are never magical and cannot be enchanted in any way, they still damage those who are impervious to physical damage (ie. they damage everyone regardlessly). What kind of sword you decide to create is entirely up to yourself. But if your first sword is one type of sword, all following swords must be of the same type. Also, whenever a Legendary Swordsmith creates a new sword (for instance a Sixth Sword), any previous Sixth Sword from the same material plane will disappear forever. The swords made by Legendary Swordsmiths are not affected by the detection abilities of even Greater Gods. Note: A Tenth Sword is rumored to exist somewhere in the multiverse. It might be just a rumor, but then agains – it might not. Power Strike: Sacrifice up to all the sword’s hit bonuses to gain damage bonuses. This works the same way as the Power Attack feat. Cut Rock: Able to cut through stone. Deals as much (structural) damage to stone as bludgeoning weapons and deal double damage against stone creatures (such as stone golems). Sword Expertise: Sacrifice up to all the sword’s hit bonuses to gain AC bonuses. This works the same way as the Improved Combat Expertise feat. Cut Iron: Deal structural damage to iron and deal double damage to iron creatures (such as iron golems). Armorcutter: Cuts through (ignores armor). Normal armors are damaged and lose 1 AC pr. hit. Magical armors are not damaged. Weapon Crusher: Breaks normal weapons which try to parry a critical hit. Magical weapons get a save, with a +1 bonus to the roll pr. magical bonus and ability. Epic weapons are not affected. Cut Anything: Deal structural damage to anything and deal double damage to all creatures which are not made of flesh and bones (undeads have bones, so you deal regular damage to them). Shield Breaker: Breaks normal shields which try to parry a critical hit. Magical shields get a save, with a +1 bonus to the roll pr. magical bonus and ability. Epic shields are not affected. Improved Armor Cutter: Magical armors are damaged and lose 1 AC pr. hit (magical bonuses are lost first). Epic armors are not affected. Improved Weapon Crusher: Breaks magical weapons which try to parry a critical hit. Epic weapons get a save, with a +1 bonus pr. level of the wielder. Artifacts and relics are not affected. Cut spells: Able to parry single target spells directed at wielder. Improved Shield Breaker: Breaks magical shields which try to parry a critical hit. Epic shields get a save, with a +1 bonus pr. level of the wielder. Artifacts and relics are not affected.